Better Call Saul star Bob Odenkirk stopped by The Late Late Show to promote his upcoming Netflix movie Girlfriend’s Day, a dark comedy about a depressed greeting card writer. Odenkirk seemed a bit peeved while having a discussion with host James Corden and fellow guest David Oyelowo, and when asked about it, he revealed the reason for his dissatisfaction: he wanted to do “Carpool Karaoke,” the popular segment (and soon-to-be Apple TV series) in which Corden and a guest sing duets while driving around Los Angeles. 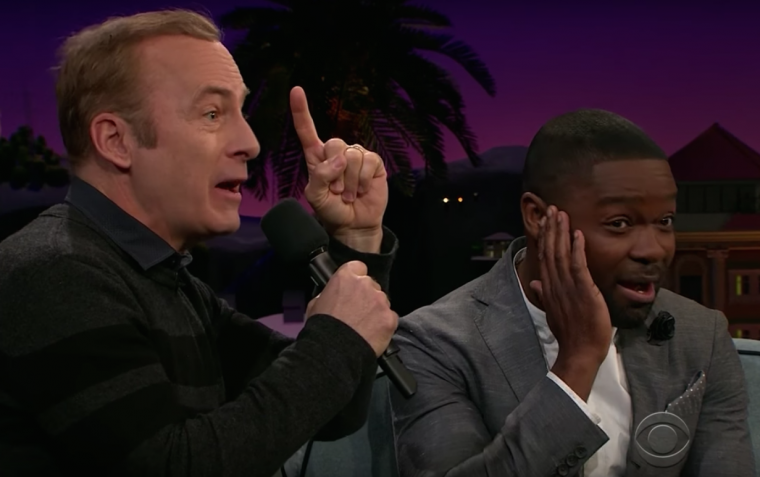 Feeling sympathetic, Corden allowed Odenkirk to do some singing, despite the fact that there was no car, and Odenkirk has no singing ability (a fact attested to by David Oyelowo’s reaction). As fans of Mr. Show with Bob and David know, Bob Odenkirk legitimately lacks the ability to sing, which was frequently part of the joke. His Barry White parody character, Larry Black, was an atrocious soul singer, while his half of the R&B duo Three Times One Minus One was limited to just dramatically saying the word “damn,” while David Cross did all of the harmonizing. Not counting his role as a golden tooth in Rap: The Musical, Odenkirk’s best/worst singing performance was probably his depiction of Willips Brighton, a spot-on Brian Williams caricature who wrote and sang Beach Boys-esque songs about his courageous battle with herpes simplex. Man, that was a really great show, wasn’t it?